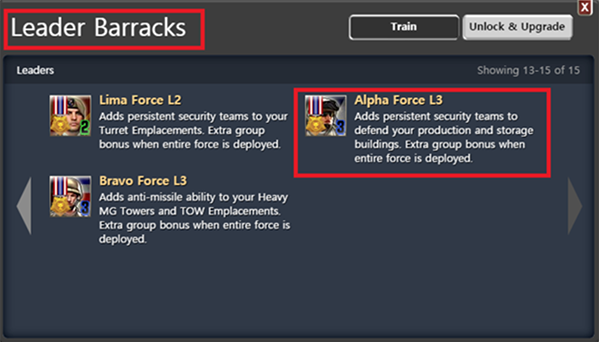 Upgrade your leaders to Level 2 and Level 3 to gain increased bonuses, like persistent security teams that defend your base even after an attacker retreats. 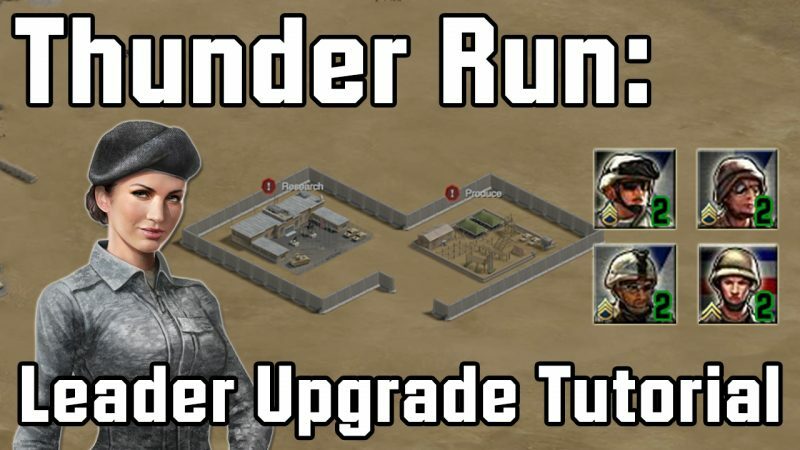 In Thunder Run, Level 4 leaders may deploy security teams as soon as enemies approach, before the building they are protecting is destroyed. 1.) 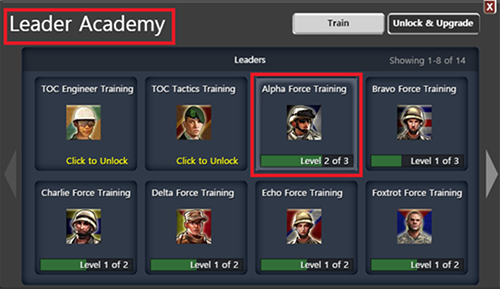 First, upgrade the leader training tech in the leader academy. 2.) 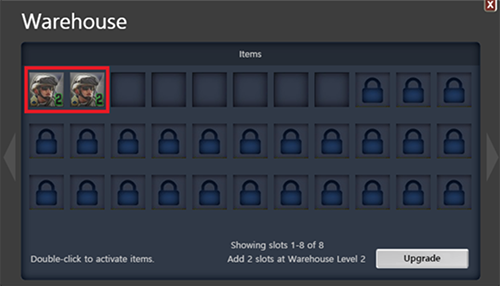 To create an L2 leader, you need 2 identical copies of the L1 leader in your Warehouse (same level and name). To create one L3 leader, you need two identical copies of that L2 leader in your Warehouse. So, in total, you'll need four copies of the L1 Leader to create one L3 Leader. (note: the Event Prizes store only allows purchasing two at a time, so if you're starting from scratch, make a single L2 leader first, then go back to the store and get 2x more L1 leaders and make the second L2 leader). 3.) 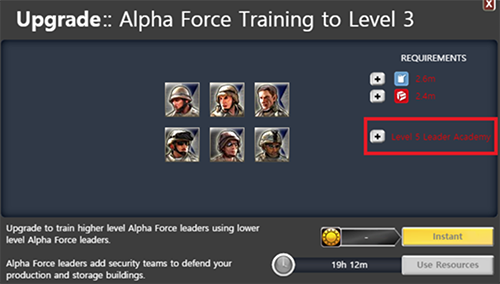 In the leader barracks, scroll all the way to the right to find the L2+ Training options for that leader Force. Last edited by bh-dan; 01-24-2018 at 11:25 PM. I'm 70 years old,,hope I can get these leaders upgraded before I kick the bucket. 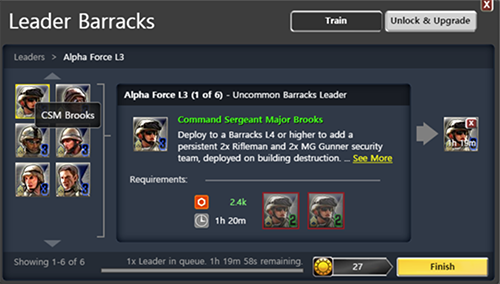 How to become a leader level Barrack? I presume you are referring to the Leader Barracks building? (correct me if I'm wrong here). You can build this building along with the Leader Academy building. 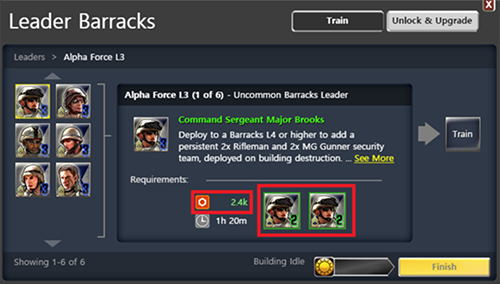 The Leader Barracks building is where you can train your leaders and on the Leader Academy is where you can research them for you to be able to train them. Too complicated. Kinda like weapons. You have to pay more than once for an upgrade. You have to pay more than once for an upgrade. Upgrading once would make it all too boring really quickly, don't you think? Agreed upgrading leaders is too complicated and time consuming and just a sheer waste of res. As for weapons all games like this have upgrade-able base weapons and yes & no, easily maxing things out can be boring but that just means you can spend more time attacking people, 1 problem with TR is that it takes months if not years to max out upgrades and that is where alot of people get frustrated and quit playing. I'm not even trying. Too damn confusing. Gimme a break.